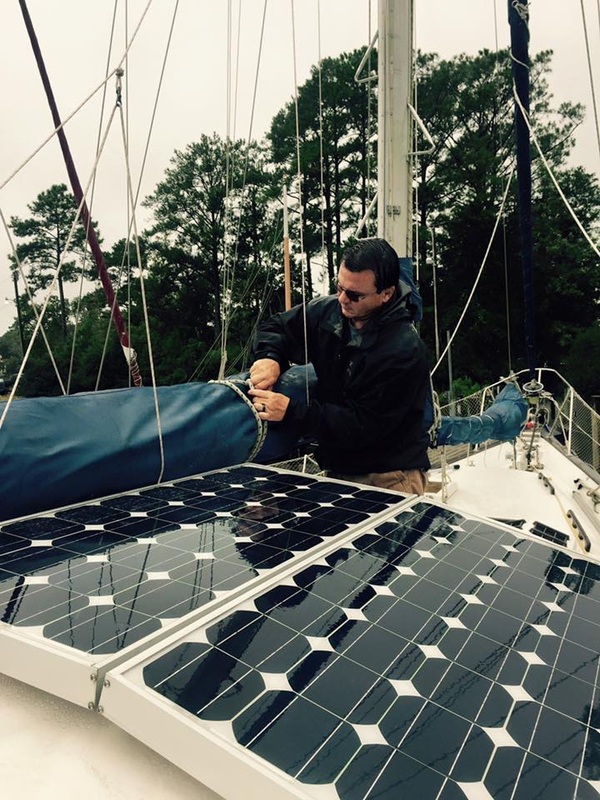 October 2015 – Interested in Learning How to Find, Select and Eventually Live On Board Your Own Sailboat? You're in the Right Place…. Wind, wind and more wind….. 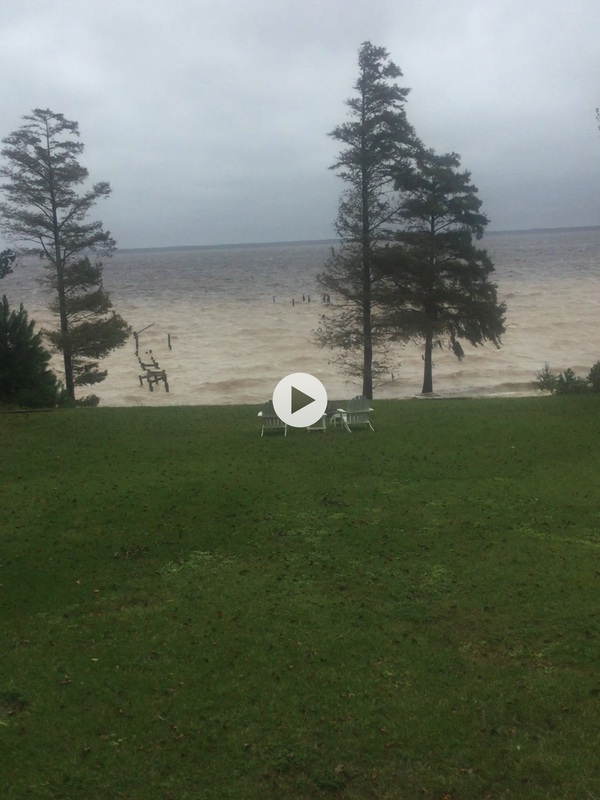 Above is a link to a short video of the windy conditions at our good friend’s house on the other side of the Neuse River…..
A still shot from the video….. Format VideoPosted on October 5, 2015 October 6, 2015 Categories About us, Experiences, photosLeave a comment on Wind, wind and more wind…..
It’s been an interesting month on board Kitty Hawk. We’ve been working on her and making some upgrades and trouble shooting a few things in preparation for our trip South in a few weeks. At first, we had pristine weather, with an occasional shower in the afternoons. We had our first multiple night guest since we moved aboard full time and our first happy hour guest. Then we had the rain….and the rain….and some more rain….about seven days worth at this point with the first short break today and another break forecast for tomorrow. During the rain we found out about Hurricane Joaquin. 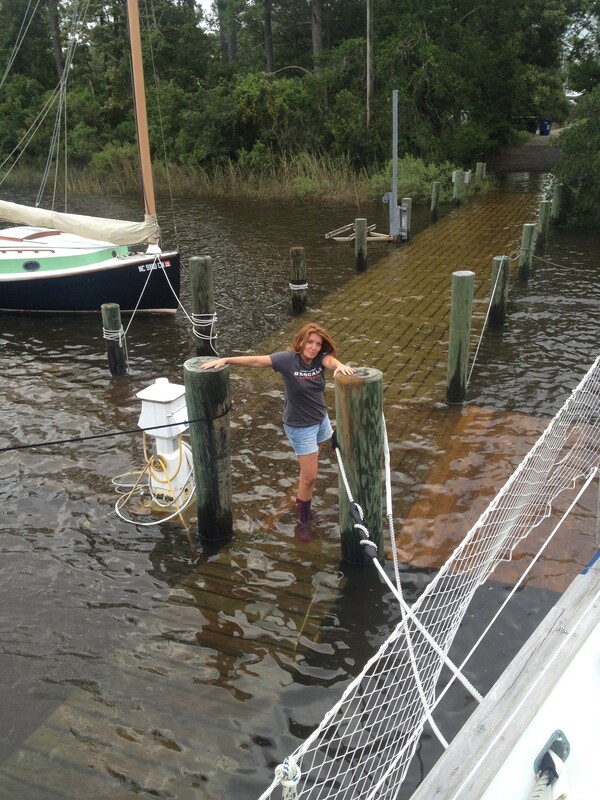 We spent a long couple of days prepping the boat for the possible arrival of Joaquin. He was kind enough to stay offshore….thank you for that Joaquin. Some weren’t as fortunate, our thoughts and best wishes go out to them and their families. And now….the wind…..it’s been pretty gusty since the rain started….but yesterday and today it really kicked into high gear……25kts to 35kts and its coming out of the North and Northeast, which around these parts, means the water levels are going up. Wind from that direction in the Pamlico Sound for any extended period drives water into the sound and then the river and then the creeks. As a result of the strong and incessant wind, we are not connected to shore power. Once the water reaches the bottom of the docks, the Dockmaster has to shut off the AC power to avoid anyone being electrocuted in the event of a damaged wire or connection at the dock pedestals. We are lucky, since we have a wind generator and the wind has been in a very, very giving mood and we have seven solar panels which, despite the cloudy conditions, have been contributing to keeping our batteries charged. That’s key for us since we have a refrigerator and freezer on board and we just stocked them up. 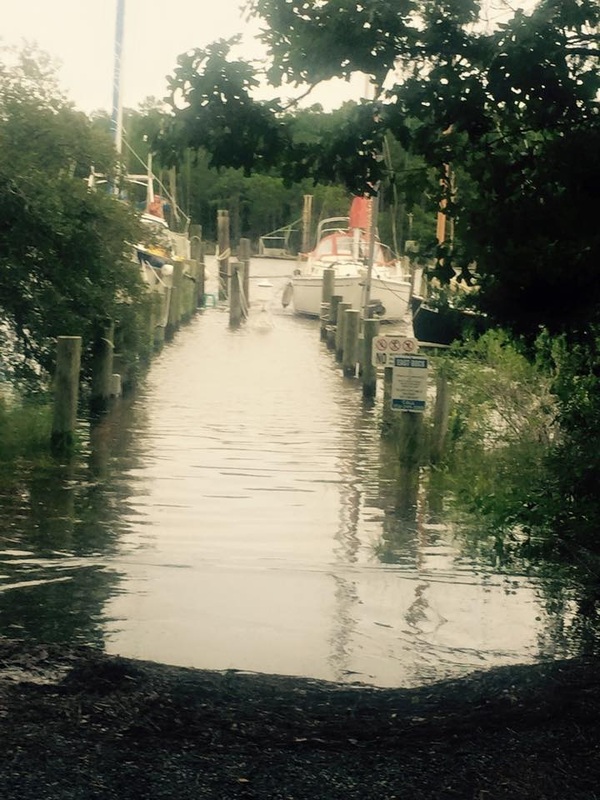 Tonight, the water rose above the docks by about 8″ or 10″. That makes getting on and off the boat a little dicey. I actually took a bit of a spill while climbing off when the step stool we have been using slipped off the edge of the submerged dock. Fortunately, I caught myself by one hand and one leg while holding my iPad and flashlight in the other hand…..I got a nice shin bruise which will probably feel really good tomorrow. Under these circumstances, Kim and I have decided that it is essential that the other know when one of us is going to, or leaving, the boat and the other is sure to watch or check up on the other. It wouldn’t take much to take a serious fall and if you were unlucky enough to take a blow to the head as you fell it could rapidly devolve into a fatal mistake. 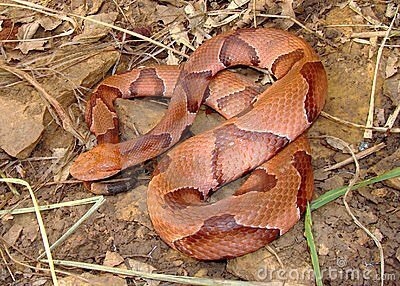 The other downside of the high water is that the local Copperhead population becomes displaced by the rising water, so you have to keep an eye out for those also. We’ve seen a few crossing roads nearby but none near the marina, yet. So, tonight we wait, we have decided to hang out at the marina clubhouse and see what the water does. Since getting on and off the boat is the riskiest part we thought we’d monitor the water from the clubhouse in case we need to move our van to higher ground. The boat is well secured since we were preparing to ride out the hurricane so that’s lucky also.